Welcome to Earthwise Valley, a New Zealand based, charitable, volunteer run, sustainable living project. Earthwise Valley is based in Tuateawa, a rare haven for nature with rainforest running continuously from mountain top all the way down to the Pacific ocean. Tuateawa has a rich human and ecological history. Volcanic cliffs rise abruptly from the Pacific with many caves and sea arches. Nearby white sandy beaches are breeding grounds for migratory seabirds, and seals & whales frequent the coastline. We believe that our Earth is not a commodity, but our community. We work to encourage our global community to increase sustainability and participate in activities that restore native forest ecology. We’re taking direct action to create an ecologically sound Centre for Sustainable Living. This includes revitalising degraded farmland, growing and planting trees, controlling animal pests and weeds, using organic and permacultural techniques, and native bush research. The Valley relies on your support - we need your donations, loans, advice, and physical labour to make a difference. Our volunteer programme suits people interested in learning about sustainable living, enjoying the outdoors, and living a saner, richer and simpler life. 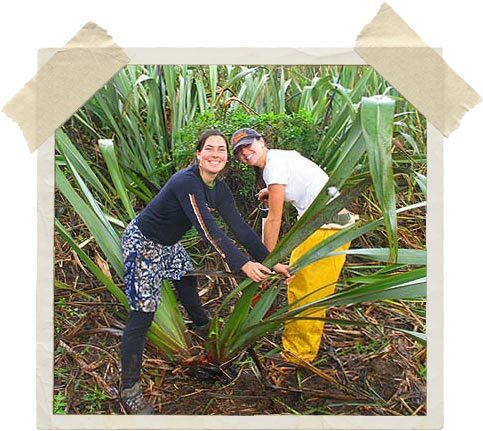 Take part as a residential volunteer and you'll experience New Zealand in a very special way while making a real contribution to Nature. Our volunteer programmes include plenty of free time for personal growth and a time-proven programme of recreation trips run continuously throughout the beautiful Coromandel Peninsula. Activities include seakayaking, hiking (tramping) and camping, horse-riding, and swimming. Recreation also involves gentler activities like reading, board games, yoga, meditation, art and music. We know the terrain and we run trips to choose the best weather and take in those extra places and experiences - hot pools, alpine peaks, Pacific beaches, and ancient forests. From kiwi birds to tuatara, butterflies to penguins, blue fungi to green lizards, little glow-worms to giant kauri trees you'll see Nature though new eyes with us. Earthwise Valley provides opportunities for people to step out of the mainstream world and explore ways of living sustainably, to lighten our ecological footprint - a way for travellers to give something back to Nature, while still experiencing some of the best adventures and sharing life with locals. Our efforts to live more sustainably include permacultural food production - with organic gardens and fruit trees, experimenting with earth building techniques, timber plantations, and we are working towards adopting renewable energy - windmills, solar panels and micro-hydro generation. In addition, staff and volunteers undertake environmental service work - planting trees, ecological surveys and pest trapping on contract, as a way to help fund the Valley and make a further gift to surrounding environs. Find out how you can get involved by exploring our website, or jump straight to our residential volunteer programmes. Earthwise Valley ‘began officially’ on August 21st 2008, when we signed an agreement to purchase the land. The property comprises almost 40 acres with a mix of degraded farmland and slowly regenerating native forest which was logged of its primary species. The land has had several decades of poor farming activity under it’s former owners, and has lost a lot of its topsoil and is was covered in weeds at the time of purchase. Poorly controlled cattle have chewed much of the native broadleaf species, as well as pohutakawa and nikau palms, and have exacerbated erosion along the stream-sides. However the land remains fertile and has a beautiful north-facing aspect, which means (in the Southern Hemisphere) that the property has dominant sun and in the semi-tropical Northen Coromandel, Earthwise Valley has a good opportunity to be restored into a real “Garden of Eden”. To date our efforts have mainly focused on growing vegetables, and establishing fruit tree and shelter trees, as well as building a small access road and dam to create a pond for wildlife.